You can pin images and videos to Pinterest by uploading them from a computer, or you can add images that already appear on a web page by entering the URL. Many websites also include a Pinterest “share” button that makes it easy to pin an image from the website you’re viewing to any of your Pinterest boards. You can also add a Pinterest button to your favorite web browser’s toolbar, allowing you to pin an image from the website you’re currently browsing. 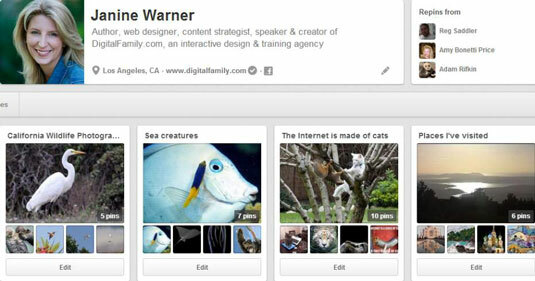 Each board on your Pinterest page needs to be named, which you can usually do around a theme. Create board names that correspond with search terms other users might use to find those images. For example, if you’re creating a board with Halloween costume pins, name your board Halloween Costume Ideas or something more specific, such as Halloween Costumes for Girls or Disney Inspired Halloween Costumes. Pinterest is an incredibly visual platform. Choose the most visually appealing pin for your board’s cover image. You want the cover image to convey the content of the rest of the board. Then take some time to rearrange the pins in a visually appealing manner, paying attention to the size of the pins as well as the content in the images. 2Click the red plus (+) sign just to the left of your Profile icon. A drop-down menu opens with options for how to add a pin. Upload a Pin: This allows you to upload an image or video from your computer. Add from a website: This option allows you to type a web address and select an image from that site. 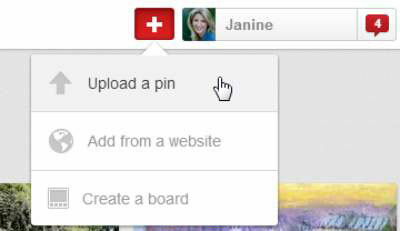 Create a Board: Choose this option to create your board before adding pins. This is not required to begin pinning. You can name your boards as you pin if you wish. When you select the option to upload a pin from your computer, the Add a Pin from Your Computer dialog box opens. 4Click the Choose File button to browse to and select an image or a video from your hard drive. The Upload a Pin dialog box opens. 5Click the Create a Board button to add the pin, or choose any existing board. When you pin something, you’re prompted to include it on a board. 6Write a description or include a message with the pin. 7Click the red Pin It button. The image is added to the specified board in your profile. Pinning content from a website by inputting the URL, using the Pin It button on your browser’s toolbar, or using an onsite Pin It button will take you through steps. You have to add a description to each image you pin as well as either add that pin to an existing board or create a new board on which to place the pin.